My entry for the The Heroes of the Storm™ Ultimate Fan Art Contest. I spent many, many hours doing this piece, and I could have spent even more, but it's time for me to let it go . Making this piece was a really good experience, since I learned so much about my own process, my strenghts, and my weakneses. Since 2009, I always wanted to draw Arthas again in an illustration, so I decided to put him against another wrathful Blizzard character, Imperius. Holy crap. Fantastic work! Imperius is awesome - one of my favorite video game NPCs all time. He's just so badass. Hi James. I will send you a note with my answer. I love this. 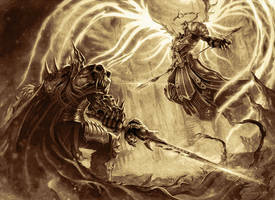 Imperius looks so Awesome, but honestly I think the Lich King would win. Thank you for your kind words. The Lich King has endless armies, so yeah he would probably win. Battle of the angry armor suits. I saw this on FB awhile back and I've been thinking about it ever since, I think it's probably my favorite HotS fanart out there! The colors and the detail are absolutely beautiful! Thank you very much for these kind words! wow this is cool! great job! Thanks a lot for your support . You are far the best among the finalists! This is my favourite! I love the contrast between the light and dark (or the blue and yellow), love the detail in the armour and the light affects. Thank you for your kind words. I'm honoured you say it's your favourite among so many other great pieces T.T. They both look awesome! Great piece! So badass. Well done! All the best for Top 3! AMIGO QUEDASTE EN LOS SEMIFINALISTAAAAAASSS FELICITACIONEEESSSSSSS!!!!!! ¡Gracias Gnomo! ¡Estoy muy contento ! This is very nice, especially the orange monochrome. Could you explain how you made it, as far as the various steps? I'm a beginner artist. Thanks. As you can see, after the initial lineart, I defined all the volumes, lights and shadows with a grayscale. Afterwards, I used a "Gradient Map" with warm tones (yellow, orange, red) in color mode above all the initial layers. All this using Photoshop. In a side of evil against evil here... I'd root for Arthas. GO LICH KING!!! Thank you. BTW, why so many people call him "Arthus"? because Arthas IS the leech king. he has a whole story arch going back to the first games that lead him into a corrupted path to become the leech king. That's Arthas actually, not Arthus. I love the sense of tension in this pic. Bravo! Thank you, I'm glad the piece transmits that to you.